Every day is a reason to celebrate. Be a self-indulgent and enjoy a week full of romance! How do you celebrate you Valentine´s Day? Do you enjoy buying each other presents? Apparently more than half of the UK population don´t plan to buy a gift for their loved ones for Valentine´s Day. 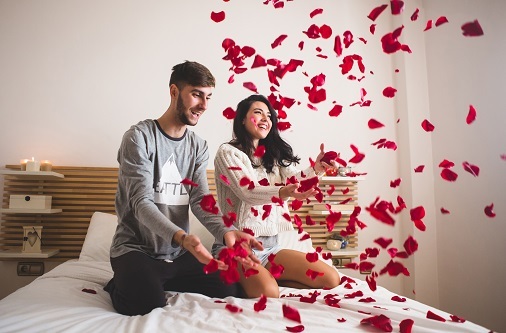 However, a study also conducted that people in UK spent almost half a billion pounds on Valentine´s Day gifts last year, men spending about 40 pounds each, which is nearly twice as much as women. St. Valentine´s Day, as we know it today, origins in 20th century, but it is said that its history can be traced back to acient Rome. It got its name after priest Valentine who lived during the third century in Rome. He become famous, because he continued to perform marriages for young lovers in secret despite of the Emperor Claudius II explicit forbiddance. In the end the priest was tortured to death. For his loyalty and compassion for couples in love people start to consider him the patron saint of love. So when we are going to celebrate St. Valentine´s this year? 14th February is on Thursday in 2019. A cold winter day doesn´t only need to be full of freezing rain, howling winds and cold. A sincere confession can melt and warm up even the most closed and guarded hearts. What about some romantic comedy, a unique present from the heart, a dinner in some fancy restaurant or maybe a weekend getaway in a romantic spa hotel? There is so many choices. But which ones are the best ones? What is the perfect Valentine gift for a woman? An amazing luxury perfume, a sparkly piece of jewellery, a beautiful and elegant watch, a box of chocolade or a bouquet of flowers – these things would make every woman happy, but if you could even surprise her by giving her something what she have been dreaming about, that would be the way to do it. And what about men? Funny novelty underwear, socks, or an exciting present such as an escape game or a laser game, a hamper, a sports watch, a lava stone massage, a manly perfume or an evening with his favourite take away. What should you choose if you would like to treat your special someone with something a little bit more permanent? I bet you can´t fail with this! Heavenly beautiful Daniel Wellington Classic Petite Sterling for ladies or Daniel Wellington Classic Black Cornwall for gents will make everybody happy for sure. Daniel Welington watches are distinct mainly for their simplicity and timelessness. Well then, who was Daniel Wellington actually? He wasn´t a founder of the brand as you might think. He was a man, who only inspired Filip Tysander, the real founder, with his vintage style of watch. He inspired him with his worn out NATO strap so much, that he named his brand after him. Allow him to inspire you as well. Show that you really care. Express your feelings with a beautiful watch. Maybe a candle light dinner or a romantic night walk in streets is all you need, because you don´t need anything else than to be together and enjoy each other´s company. Have you decided to celebrate St. Valentine´s Day in a big way? Then you can´t do it without a proper Valentine´s Day card! You can either buy some luxury Valentine´s Day card or come up with your own funny Valentine´s text, but the main thing is to reveal how you feel. 1. Happy Valentines Day Darling.. I feel so happy around u. When you r not with me, its your memories that brighten up my gloomy days. I will love you forever and Ever! 2. Its here... the day to celebrate love, yes its valentines day, u were mine, you r mine and i m sure that you ll remain mine for rest of my life. Happy Valentine's day my love. 3. It will be ordinary to say I LOVE YOU But it is true when I say YOU ARE THE LOVE OF MY LIFE. Check out our Valentine´s Day offer and don´t forget there is no better day to pamper each other.